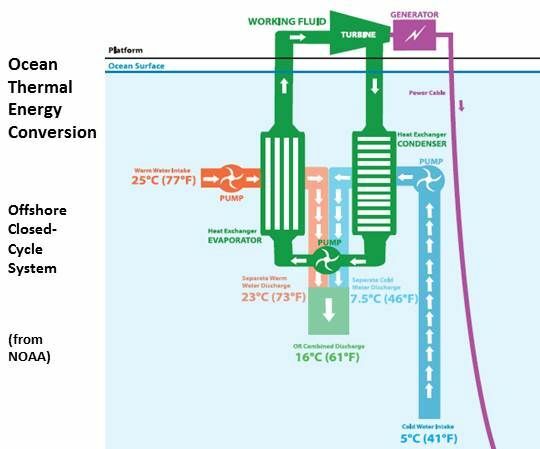 A major obstacle to ocean thermal energy conversion may be resolved. A barrier to advancing the development of the massive ocean thermal energy conversion (OTEC) resource is its potentially adverse biological impact, but a new DOE-funded study carried out by Makai Ocean Engineering found the biological impact can be minimized. 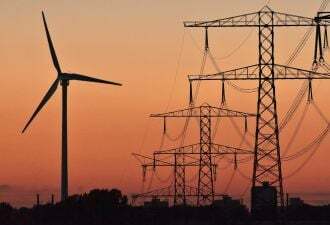 This is expected to remove a significant regulatory obstacle to permitting pilot projects and clear the way for OTEC developers to move toward building 100-megawatt deep ocean power plants. OTEC uses the higher temperature of the ocean’s surface water to turn liquefied ammonia, which has a very low boiling point, into a vapor that drives a turbine in the same way steam from water boiled by nuclear energy, fossil fuels or concentrated solar energy drives a turbine to generate electricity. For a 100-megawatt plant on a floating platform much like a deep water drilling rig, tugboat-sized engines would pump the 25-degree-Celsius surface ocean water into an evaporator that vaporizes the ammonia. The vaporized ammonia then passes through the turbine, thereby compelling it to move, and is recaptured. Engines then pump cold ocean water of approximately 5 degrees Celsius into a condenser that cools the recaptured ammonia back into a liquid so it can be cycled back to the vaporizer in a closed-loop system. The potential biological impacts would come from the water discharged into the ocean. It cannot be discharged at the 20-meter-to-40-meter, near- surface, light-permeated depths of the evaporator and condenser where ecosystem-sustaining phytoplankton populations thrive. The cold water brought up to the condenser from a kilometer below the surface has sources of nutrients in it that could cause a phytoplankton proliferation or an unwanted algal bloom. The published report on Makai Ocean Engineering’s research, entitled "Modeling the Physical and Biochemical Influence of Ocean Thermal Energy Conversion Plant Discharges" indicates that if the water is returned to a depth of approximately 70 meters, it would not cause an ocean environment perturbation of biological significance. Permitting is “a key hurdle for OTEC,” Grandelli said, because small startup companies don’t have “the deep pockets” to get through a long and rigorous application process. Because Makai Ocean Engineering worked closely with NOAA on its research, Grandelli suggested, the regulatory agency is now in a position to more readily approve OTEC applicants with biologically non-impactful water discharge designs. “From a practical engineering standpoint, it makes the design of a real-world OTEC plant possible,” Grandelli said. Now, he explained, design engineers know to plan for a 100-megawatt OTEC plant’s nine-meter-diameter water discharge pipe to go approximately 70 meters into the ocean. 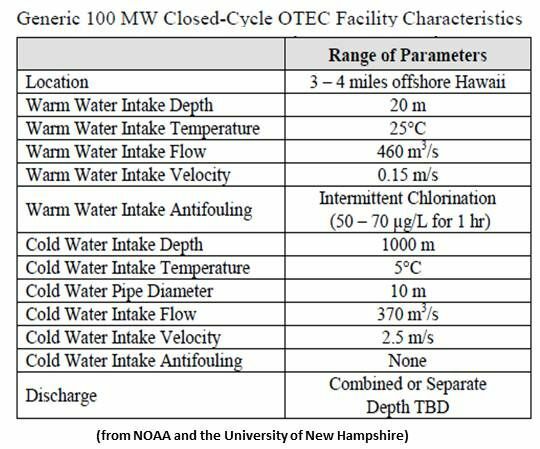 OTEC’s potential to provide baseload power is immense, Grandelli said, perhaps ten or even 100 times that of wave power. He cited a standard engineering textbook calculation of eight times 10^21 potential British Thermal Units (BTUs) in the world’s oceans between 20 degrees north latitude and 20 degrees south latitude, where there is the requisite 20-degrees-Celsius temperature gradient. Makai Ocean Engineering is working with Lockheed Martin (NYSE:LMT) on a kilowatt-sized demonstration project on Hawaii’s Oahu Island and on the design of a 10-megawatt project. 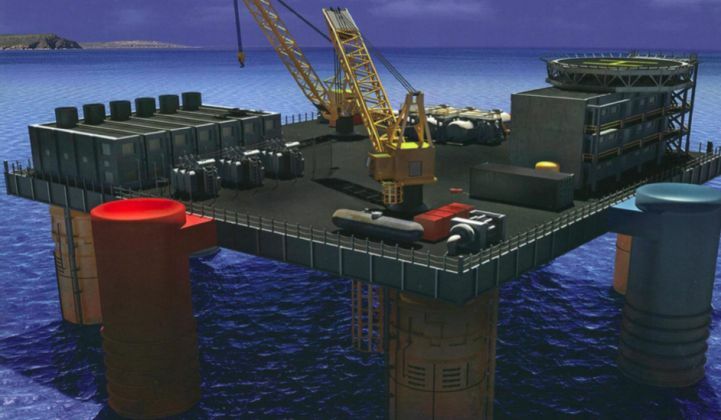 A 100-megawatt floating OTEC platform, Grandelli said, would resemble a moored, deep water oil platform and be “more narrow and deep, like a barge.” Such a power plant would require a number of tugboat-sized engines, each pumping 750 metric tons of ocean water per second. French state entity DCNS Group is moving ahead with plans for a 10-megawatt project in the Caribbean, off Martinique. OTEC International, backed by the Abell Foundation, is working on plans for a 1-megawatt pilot project in conjunction with the state of Hawaii.